Apollo Down is a fun record. It’s as if The Spiders From Mars got a ride in a yellow submarine—in space. A finely tuned rhythm section, with fuzz guitars layered over perfectly structured synth lines, allow Larsen’s beeps, whirls and sonic tidal waves of cosmic debris to flood over every track on this record. 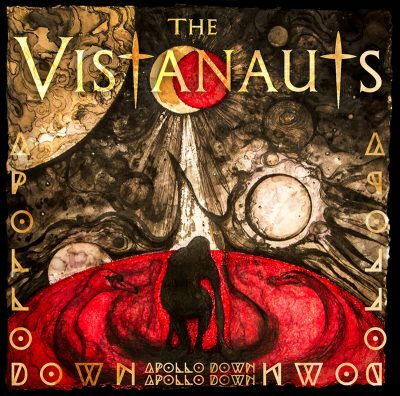 The Vistanauts are Tom Larsen (vocals, guitar, keyboards), Stephanie Selcho (drums), Kent Rytting (lead guitar) and Anton Nielsen (bass). It is hard to filter out this influence when listening to Larsen’s band The Vistanauts, because Bowie is so much there on the surface. It’s OK to imitate your heroes, and Larsen does just that—however, this isn’t a Bowie tribute album. This is a Vistanauts record. Whether it’s Starman, Ziggy Stardust or The Thin White Duke, Bowie is, and always will be, one of the gold standards of interpretation. It is a badge of honor to be Beatles–esque or “that guy that sounds like Bowie.” Local legend Tom Larsen does in fact “sound like Bowie”—so much so that Larsen heads a Bowie tribute band called Major Tom & The Moonboys. Imitation is delivered in an original package with catchy sonic space freak songs that capture your attention with a glam rock, fun-house, mindfuck vibe. Larsen ties the whole album together in a pleasantly perfect, pretty pink boa. Editorial Note: An earlier edition of this review incorrectly named the bass player of the Vistanauts as Brady Anderson, as opposed to Anton Nielsen. Changes have been made to correct this error.